UPDATE | The Port of Long Beach Board of Harbor Commissioners approved on Monday a project to redevelop a rail yard in the Harbor District aimed at more quickly moving cargo with less of an environmental impact. The approval came after the last public hearing on an environmental impact report took place. Port officials said the next step includes the board’s consideration of a baseline budget for the project following the completion of preliminary designs over the coming months. The Pier B On-Dock Rail Support Facility would be located southwest of Anaheim Street and the Long Beach (710) Freeway. 1/19/18 at 1:27PM | A public hearing is scheduled Monday to discuss an environmental impact report on a proposal to redevelop a rail yard in the Harbor District to move cargo more quickly with less of an environmental impact, the Port of Long Beach (POLB) announced. The hearing will take place during the Board of Harbor Commissioners meeting. The facility would provide track space to join together trains assembled at terminals, according to the port. With no cargo trucks visiting the facility, officials said it would enhance the environmental benefits of pushing more cargo to rail transportation. See video of the project here. If the document is approved by the commission the port will continue to stay engaged with the community during the progress of the project, officials stated. 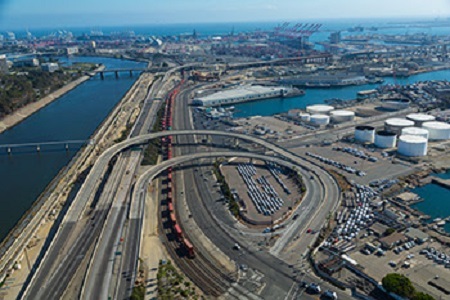 The Pier B On-Dock Rail Support Facility would be located southwest of Anaheim Street and the Long Beach (710) Freeway. The commission will consider the final EIR for the facility at its regular meeting on Monday, January 22 at 6:00PM at the Port’s Interim Administrative Offices, located at 4801 Airport Plaza Drive.